Mike Hensen, Senior Program Coordinator at the Center on Globalization, Governance & Competitiveness at Duke University recently sent me a fairly depressing article that examines the Tar Heel State and how its different regions have fared economically over the last few years. The Council on Foreign Affairs published the first Working Paper in its Renewing America series titled After Manufacturing, Lessons for a New Reality from North Carolina. In the paper, the author Roland Stephen documents the amazing declines in U.S. manufacturing employment, from 1 in 4 U.S. workers in 1979 to 1 in 10 today. Stephen acknowledges the role of outsourcing in this precipitous decline, but also opines that productivity gains played a big role. This “productivity” explanation has recently been called into question. In the last two decades in North Carolina total employment rose by 23%, even as the state lost half of its manufacturing jobs. 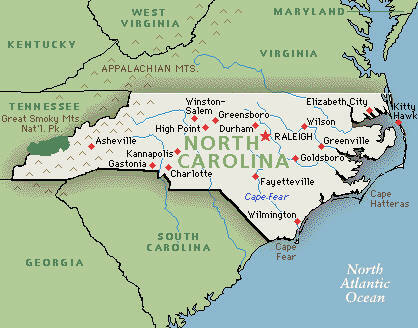 To explain this phenomenon, Stephen discusses three regions in North Carolina: Hickory (old style manufacturing areas), Asheville (areas with lots of non-traded service sectors) and Raleigh (areas with internationally traded sectors specializing in technology-intensive goods and highly skilled professional services). As you might imagine, if you live in Hickory, you are hosed. The region lost tons of furniture and textile manufacturing jobs over the last twenty years. The region has chronic unemployment and slow economic growth. Because you could make a decent living in manufacturing without going to college, education levels are relatively low in Hickory. Asheville is a mixed bag. It lost a lot of manufacturing jobs, but has replaced a lot of them with service jobs. Asheville has lots of college educated people because many of its service jobs require a college education, but those jobs don’t pay very well. Raleigh is the happening place. Lots of jobs have been created over the last twenty years. Nonfarm payroll grew by almost 70 percent over that period, including rapid growth in high-income business and professional services sectors. Raleigh’s businesses are world beaters: biotechnology, information technology, and software-related businesses. At the same time lots of jobs in health care, leisure and hospitality have been created. Median income in Raleigh is $60,026, more than $15,000 more than the median income in Asheville and Hickory. Raleigh would be like Hickory and Asheville but for its three major research universities: Duke, UNC Chapel Hill, and North Carolina State. Over 47 percent of the population over the age of twenty-five has a bachelor’s degree, a level that is among the highest in the country. Let’s all live in Raleigh! Stephen seems to have no hope that the “old jobs” will ever return. “The challenge facing each type of region—in North Carolina and the United States—is to determine which new jobs, and of which quality, will offset the losses of old jobs. Each region scrambles to find new jobs as old industries disappear. But while policymakers may dream of an economy populated by bankers and geeks, these sectors will never employ most people.” Lots of people will be working in Asheville, providing all sorts of services including education and health services. Some of these jobs require quite a bit of education, but hardly any of them are very well paid. Then you have the people working at Starbucks who have a Philosophy degree from Cornell, Smith, or other similarly expensive university. I don’t know which is worse, getting a job that requires you to get a college degree and then pays you poorly, or having to take a poorly paid job after you graduate from college and find that there are no jobs, let alone well-paying ones, in the field you studied. This entry was posted in american made, Apparel, Made in America, made in usa and tagged Asheville North Carolina, Duke University, Hickory North Carolina, Made in the USA, North Carolina, Raleigh North Carolina. Bookmark the permalink. 2 Responses to Other than that Mrs. Lincoln, how was the play? That’s all well and good for Raleigh but how do we reallocate some of those white collar jobs to a place like Asheville? It’s enjoyable talking to my highly educated bartender or waitress in Asheville and I always leave a nice tip for the conversation and service but I don’t think that helps them much to obtain the American dream they had when they borrowed lots of money to go to college like their HS counsellor and college recruiter urged them to do. Asheville has a low unemployment rate that’s true, but a high cost of living and taxes. They’re working…but in the service industry for low wages and maybe tips, not using their education, or gaining experience that can help them find a better job and the longer they languish in service jobs the less attractive they are to employers seeking the latest educated applicants and when the economy improves may be pased over for fresh graduates creating a lost generation of college grads. Asheville, has low unemployment figures but also the highest % of working poor that require food stamps and other government services to make ends meet. Asheville is attracting new industry in the form of breweries and some new manufacturing jobs and that’s great, but it’s a trickle that doesn’t keep pace with demand and sorely needs to create lacking jobs in the middle class. Not being negative here but looking for advice on how middle class jobs can be generated, incubated or enticed to come to the mountain region. Looking for suggestions. Flatrat: Thanks for the comment. I think the way to create middle class jobs is to revitalize consumer goods manufacturing in this country and the way to do that is by making American made furniture, appliances, cars and other goods our default choice when shopping. If we could reduce our trade deficit in consumer goods with China by 1/3, we could create one million middle class jobs in places like Asheville. Thanks for visiting the blog and thanks for your great question.